With the installation of new energy efficient lights, Argonne is estimated to save nearly $160,000 in taxpayer funds and more than 2,420,000 kilowatt hours of energy annually. The lab’s new lights are brighter and simulate natural daylight, making workspaces safer and employees more productive. T5 fluorescents were installed, cutting energy consumption in half compared to traditional bulbs, and the T5s last two years longer. The bulbs have a high color rendering index value of 85 out of 100 — meaning that they come close to reproducing the way colors look in daylight. The lab has installed T5 lighting in buildings that house operations that require care and precision, such as automobile servicing, shipping and receiving and management of spent experimental materials. Recently honored with a federal award for energy and water savings, Argonne is lowering its campus energy footprint in creative ways. These hybrid solar- and wind-powered streetlights, which are completely off the power grid, adorn Argonne sidewalks. 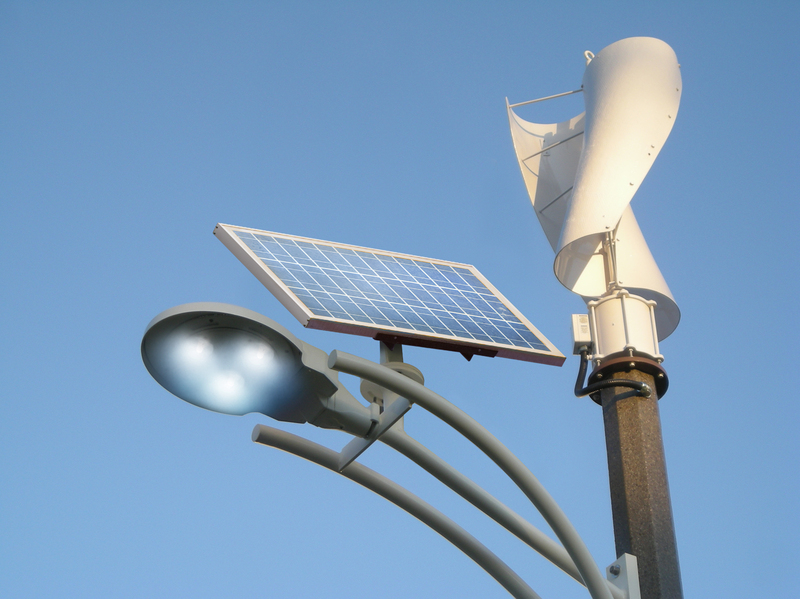 A small solar panel and wind turbine powers the LED light atop the fixture. The light can store energy in batteries for up to three days without sun or wind. Argonne uses light-emitting diodes (LEDs) in streetlights and other outdoor lighting. Using LEDs outside allows heat to dissipate from the fixtures; the bulbs contain aluminum components that help convect heat from the light to the surrounding air. This prevents overheating that lowers the efficiency and lifespan of the lights. Though LEDs have a long-term return on investment compared to T5 lights, they last longer and save more energy. Under ideal conditions, LEDs can provide 50,000 hours of light while T5 lights provide around 20,000 hours. Argonne is currently piloting two kinds of LEDs for streetlights on campus. While traditional streetlights have a power rating of 400 watts (W), the new lights are around 145 to 106 W. LEDs distribute light in a wider radius than traditional lights, which simply direct light straight down from their fixtures. “With the LEDs, it would feel like there is always a full moon out; people would be able to see easily and walk around at night,” said Architect George Norek, one of the lab’s energy-efficiency lighting project leaders. The new external fixtures are also equipped with photosensors that prompt lights to turn on in the dark and off in daylight. The installation of energy-efficient lights is part of Argonne’s on-site sustainability efforts. The lab has reduced energy intensity usage by 20.6 percent, compared to baseline 2003, putting the laboratory on track to meet its 30 percent energy intensity reduction goal by 2015. Argonne is committed to keeping its energy and water consumption to a minimum. The laboratory aspires to be a responsible steward of its public funding and a good neighbor to the surrounding communities. Argonne's sustainability plan calls for efforts in several areas, from "cool roofs" to landscaping with native plants that require little or no watering. See "Strategies" for details.